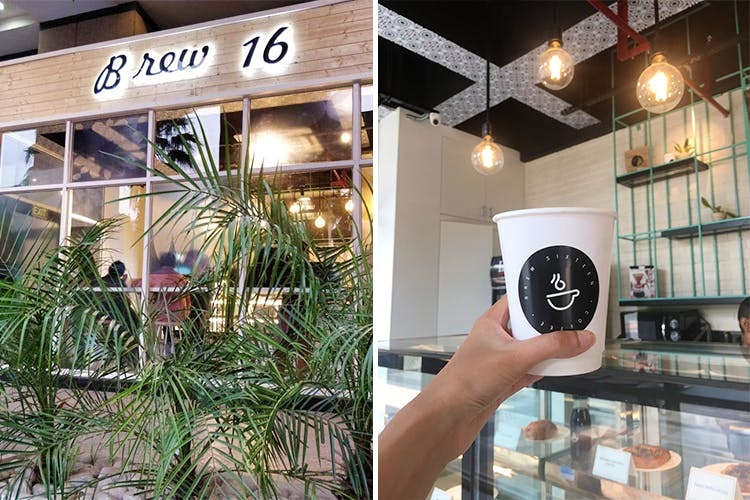 We discovered Brew16, a tiny (but cosy) coffee shop in Cyber Greens, right opposite Cyberhub. They've got great coffee and snacks to munch on in between work. Iced latte, dark chocolate sea salt cruffin. They're right in the middle of all the offices in Cyber Greens, so it's perfect if you're craving good, strong coffee super-quick (there is no tea available here). They've got Blue Tokai brews, a great iced latte, cold brews and coffee tonic. If you're looking for hot coffee, they've got your basics—flat whites, Americanos and the like. It's a tiny space, but done up with printed tiles on the floor and dangling, large bulbs above. With a limited (but delicious) food menu, they've basically got a bunch of quick bites. We had the dark chocolate sea salt cruffin, delicious and well-paired with our cold brew. They were out of their S'more croissants, but friends who've tried it have loved it. Otherwise, their grilled chicken and onion jam croissant is also good, and so is their morning bun. They're definitely winning for quick, delicious coffee right now. We wish they had more food options, but we were told they're introducing stuff like sandwiches and salads soon.